OK... Los Angeles and San Diego were amazing family vacation spots! We saw and did so much! The top photo is at Universal Studios with Classic Jaws! 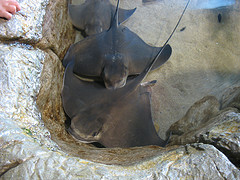 When you get to Sea World in San Diego, make sure you pay the six bucks and feed the Bat Rays! You can pet them for free, but it feels so COOL when they eat out of your hand!!! We would have had more of our own photos, but Bob thought he could video Shamu, while we sat in "The-Soak-Zone"...only to become totally deluged with water! Soak Zone means...SOAKED! Travelocity was again amazing in their choices for hotels. Nobody beats their selection of price, ratings and amenities in narrowing down our family needs in a hotel. Now Save Up to $525 when booking a F+H Vacation Package with Travelocity. Plus we go a hot deal in ticket right off the Universal Studios site. Disneyland® and Disney's California Adventure. 3-day Park Hopper® Bonus Ticket for three days admission to both parks with between-park privileges. Universal Studios HollywoodSM. 1-day General Admission. 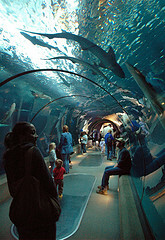 SeaWorld® San Diego. 1-Day Admission. Do Not Miss This!!! San Diego Zoo® or San Diego Zoo's Wild Animal Park. Your choice of 1-day admission to either park. CityPass delivers six days of unforgettable fun and adventure at a savings of over 30% - - with 14 days to take it all in. Valid for 14 consecutive days. Free return visit to Universal Studios Hollywood (valid for 7 days after your initial visit). Retain your original ticket and show it to the turnstile attendant for your day of free admission. Free visit is non-transferable - valid ID and fingerscan will be required for free visit to validate ticket holder identification. If you purchase your Southern California CityPass using Print@Home ticketing, your ticket must be redeemed FIRST at Universal Studios Hollywood, where you will receive your tickets to the other attractions. These tickets are valid for use any day through (and including) January 3, 2011. Wow, heh? !